I honestly don't know; maybe someone who finds "pastoral" stories soothing. 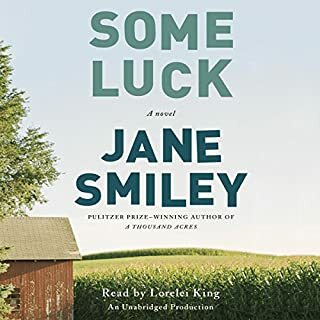 What was most disappointing about Jane Smiley’s story? The book started out from the perspective of a baby, and continued in this fashion way too long. Too much time was spent on uninteresting, descriptions from a child's point of view that did little to enhance the story. I wanted to gnaw off my arm. There was no genuine character development. At times the story seemed to pick up, but then fizzled again. What character would you cut from Some Luck? Possibly Henry--his story never really went anywhere. I should have known that it would be difficult for any author to develop an interesting multi-generational story in a relatively short book. The only reason I kept listening was that I'd spent money on it. I'd like to warn others not to make the same mistake.